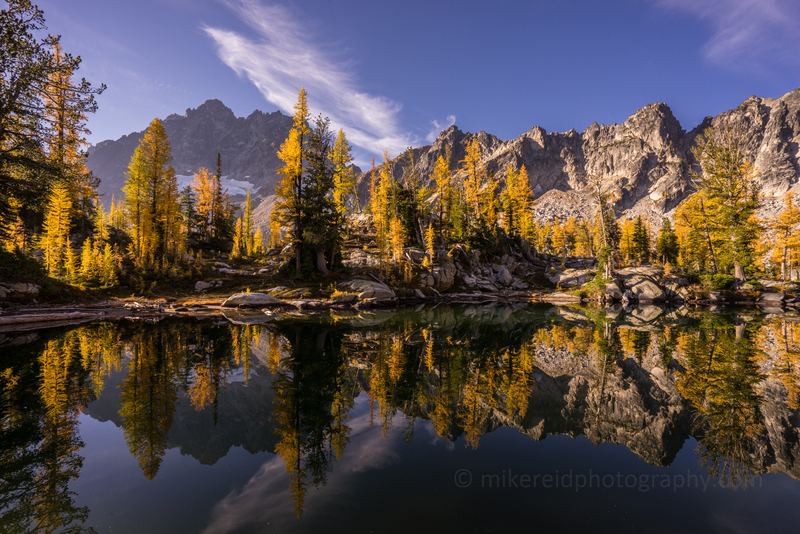 Each year I contemplate the hike I will be making into the Enchantments for larches and fall colors. I go over hiking gear lists, camera gear, food plans, compositions, etc. 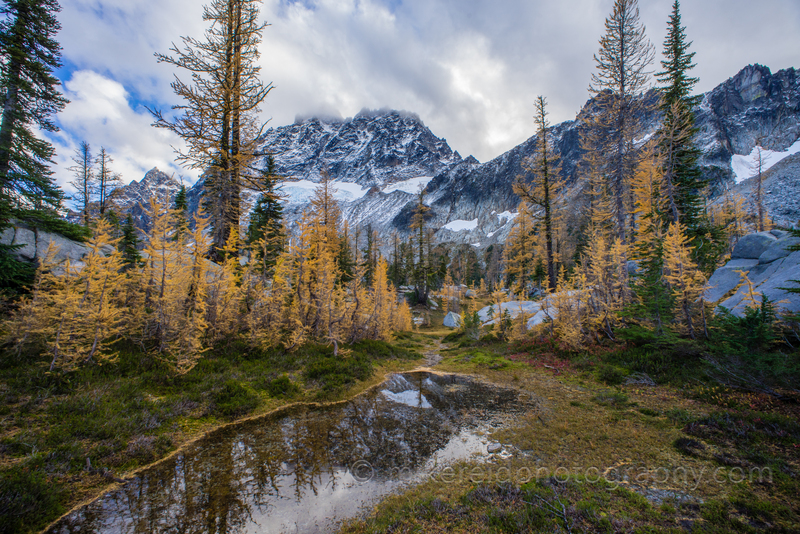 I decided to go Snow Lakes route this year, having gone Asgaard Pass out of the Stuart Lake trailhead the previous two years. My camera gear was my Sony a7r2, Zeiss 55 and Zeiss 16-35 lenses along with my Voigtlander 10mm. I brought my carbon tent pole tripod, which was pretty underwhelming so my shots were all handheld. For hydration, I brought two small bottles of gatorade and made more with Endurox R4 and electrolyte tabs as I hiked. Food-wise, I had oatmeal and high protein granola, a stack of peanut butter and honey sandwiches and a pile of snacks heavy on Snickers bars. I left the trailhead at 32lbs, which I was pretty happy with. FWIW, I don’t do poles after an unfortunately pole to tooth incident a few years back, and I drink straight out of fast-moving streams. This has always worked for me, but I don’t necessarily recommend it for others. Once the dates were in place, I put out some invites for others to go along. All this inviting resulted in two people going with me: Jenn and Erwin. Erwin insisted on camping halfway up which is new to me but we found camping at Snow Lakes to be a nice break and got some great shots there. Another nice part of staying at Snow Lake is that the next section is flat for a while. Having rounded Snow Lake, however, the climbing begins. 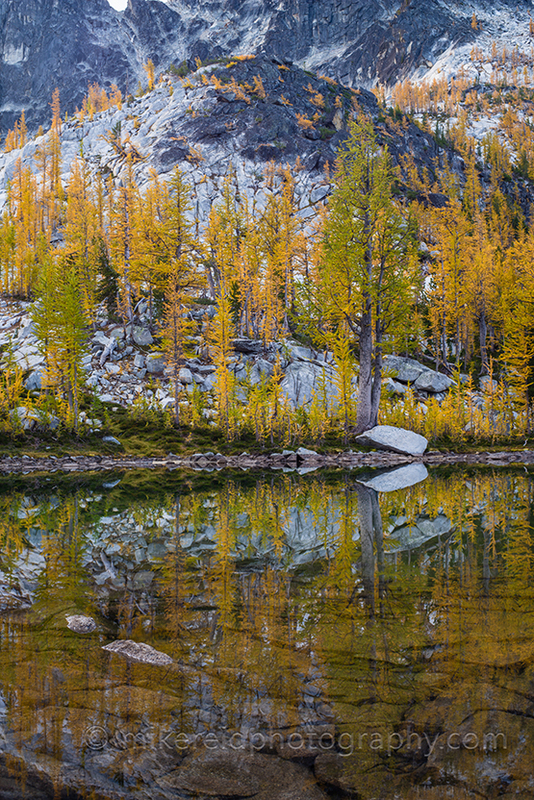 We took it slow and got to Leprechaun Lake in a few hours. 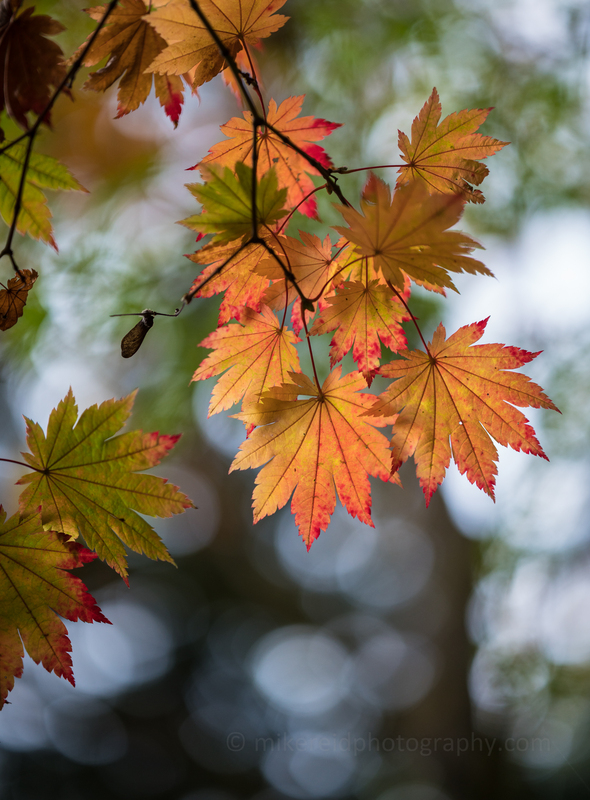 Fall colors were beckoning out on Highway 20. 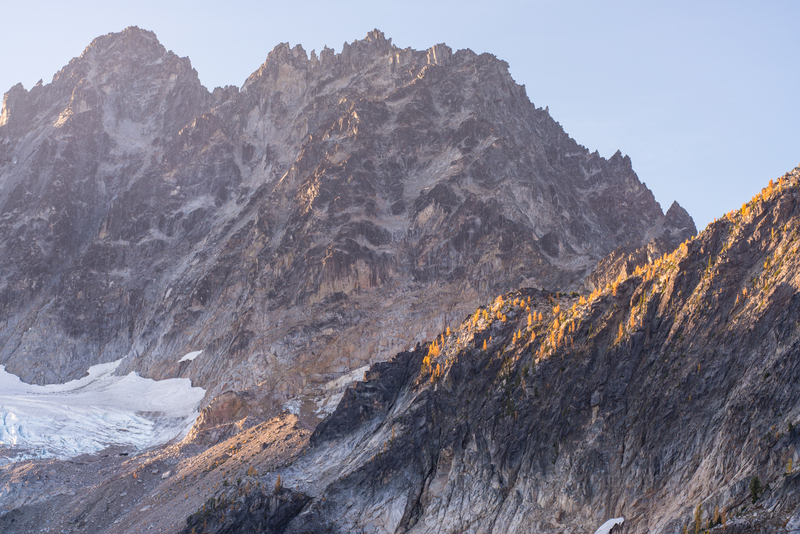 Its a bit of a drive to this wonderland from Seattle, but oh so worth it. 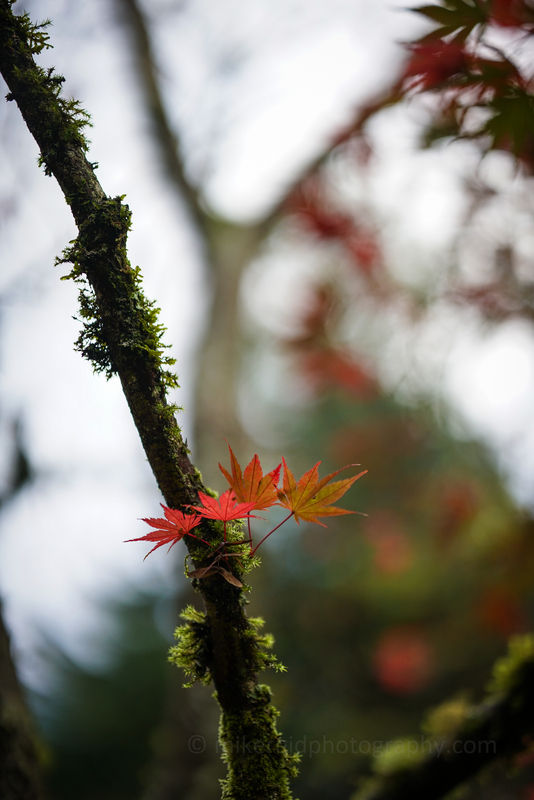 There are several awesome fall colors hikes along the highway. We arrived at the Blue Lake trailhead in the afternoon to a full parking lot and cars parked out on Highway 20. When we came back after sunset, the lot was empty. 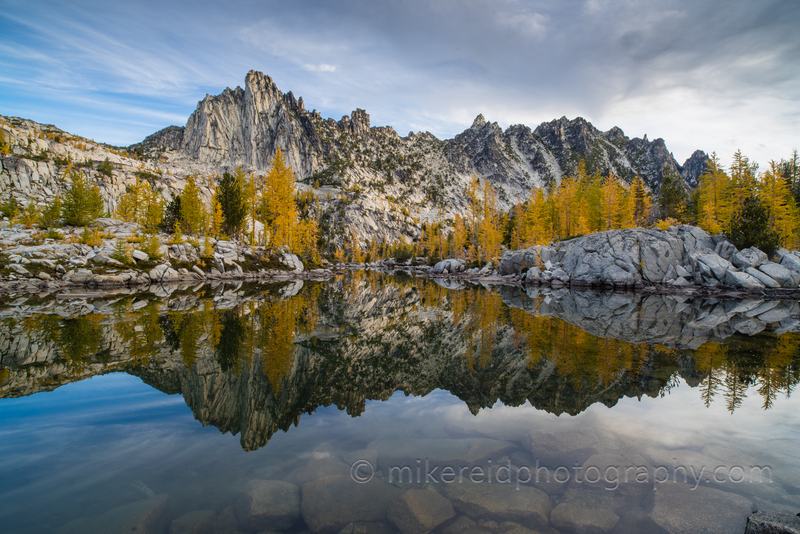 First off I should say that I cant stay away from the Enchantments Lakes Basin in Washington State. 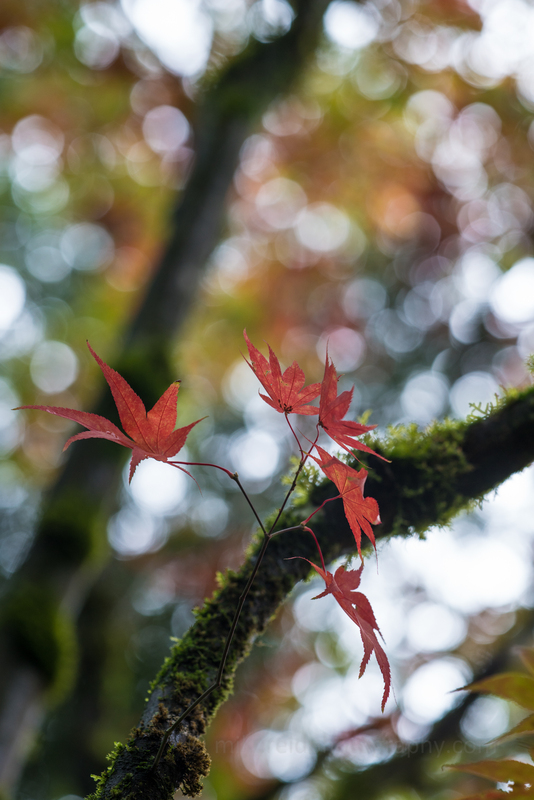 Each Fall, I have to go at least once. The first time I went, I carried way too much stuff and finished the through hike in 17 hours with bleeding feet and a strong desire to crawl back to my car. Two weeks later however, I wanted to go again. Since then, I have become a scientist of sorts figuring out how to lighten my load and make the whole experience more fun. 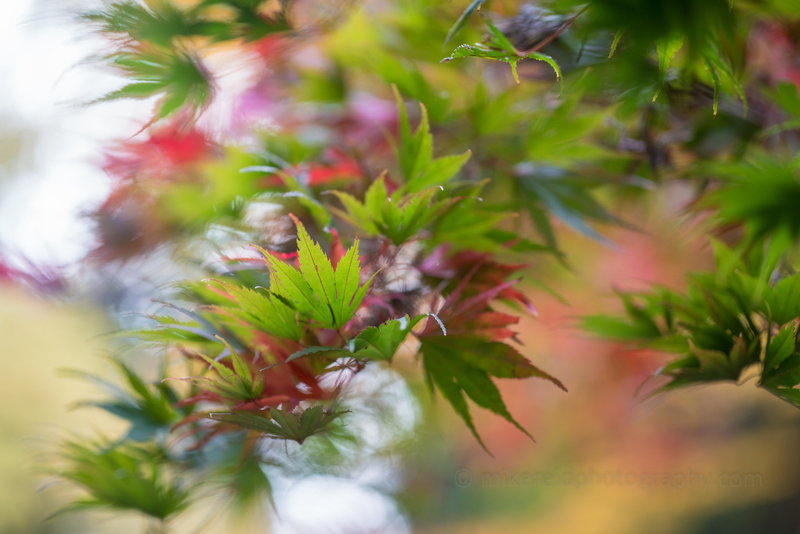 Last week, I headed up to get some fall color before I fly off to China for a work trip this week. I saw a lot of miserable people coming up the trail, carrying too much stuff. Actually it was usually one excited person and then the others they had talked into going. I recommend taking a hard look at your load and gear. My pack was a 45L Zpacks Arc Blast, which weighs less than a pound and carries beautifully. My bag was a 10 degree Zpacks 900 fill down bag which weighs 22 ounces. My tent is a Tarptent Contrail which weighs 27 ounces and has never let me down. I won’t soon forget seeing someone carrying a full-sized Costco tent, still in the box, bungee-corded to their pack. Or hikers carrying iron skillets. Ugh. And for the record, you don’t have to spend a lot to go light. Ebay, hiker gear for sale sites, craigslist and manufacturer’s website bargain bins are all great sources of discounted gear. I seldom if ever buy new and only as a last resort. I saw people carrying gallon jugs of water. I carry one small bottle of gatorade and filter as i go with a Sawyer bag filter. I carry “gatorade” tablets to make more as i go along. Now the camera gear is where i splurge, since that is why I am going. I recently swtiched from Canon to Sony, which lightened my load a bit. I see people carrying Gitzo 4 series tripods. I would never do this. I carry my Gitzo 0540 and it feels excessive. Other times I have carried my Tamrac Zipshot hiking pole tripod which weighs 8oz. 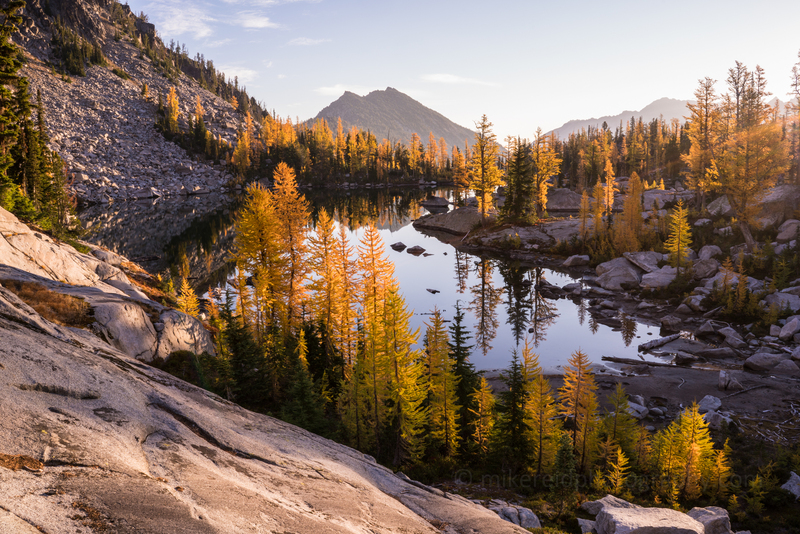 The Enchantments Lakes Basin is one of the toughest and most rewarding hikes in Washington. 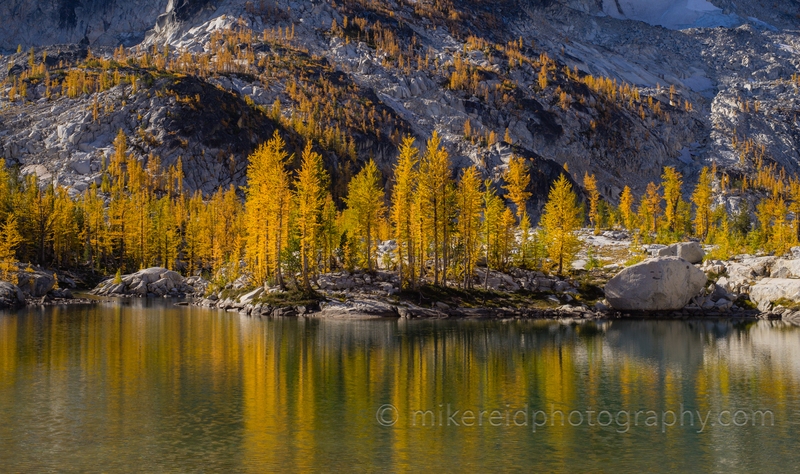 Once you’ve been up there, it’s hard to stay away as the larches turn golden in late September. This year I decided to take two cameras, three lenses and two tripods. 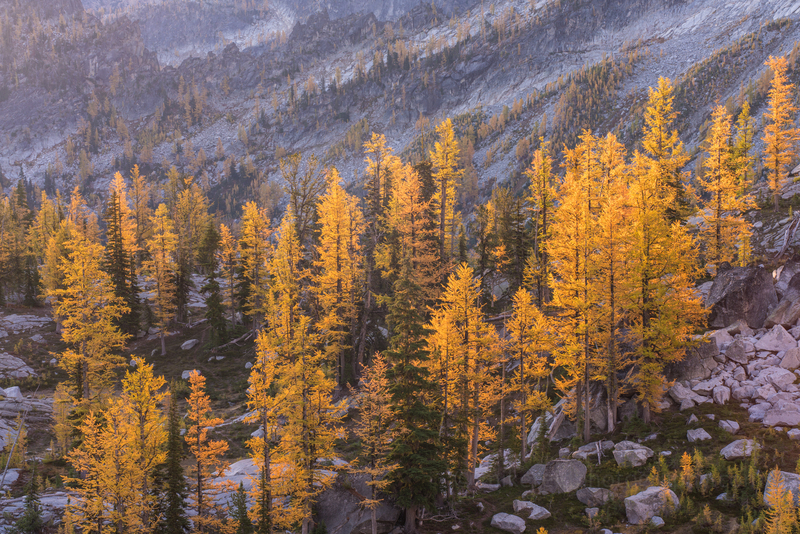 I was particularly excited to see how the Zeiss 85mm Otus would capture the detail and the glow of the larches as they showed off their autumn palette. 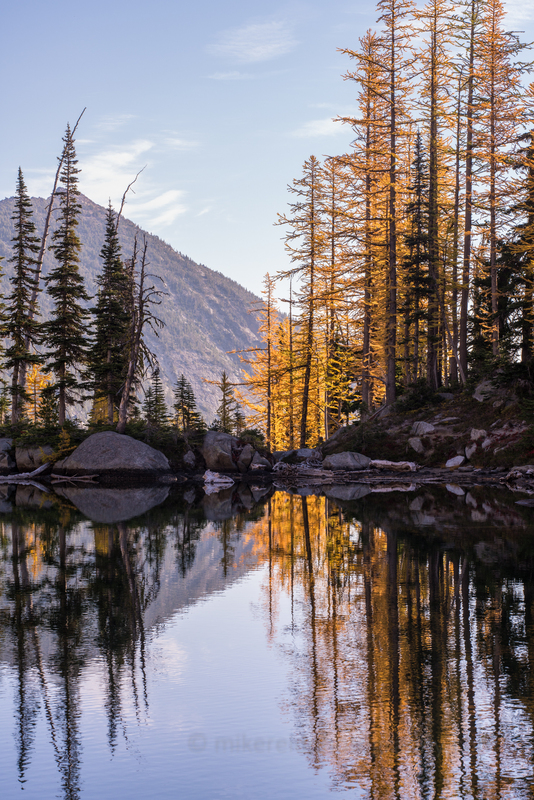 I found that this Meetup.com group had borrowed one of my Horseshoe Lake photos to entice people to go on the hike this last weekend. So I joined and gave the group leader some good natured static over using my photo and off we went to the lake. 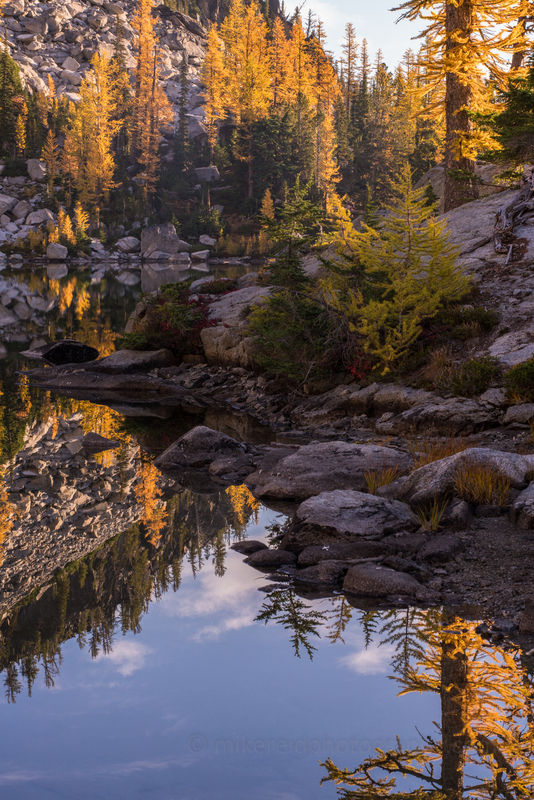 This is a less known corner of the Enchantments Lakes basin, which is known for its amazing granite and fall colors scenery. Its also a rather challenging hike. The last mile covers about 1500 vert feet alone to get to the lake. Got there for sunset, camped and then sunrise and then down. All Zeiss 18mm, 9oz tripod and Sony a7r.